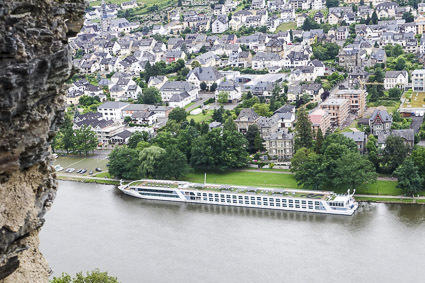 More than a dozen cruise lines make it easy to tour Germany and neighboring countries by ship. More than a dozen cruise lines offer cruises of a week or longer on the rivers of Germany and neighboring countries. Such cruises are an increasingly popular alternative to touring on land, since they let travelers visit cities and towns over a large area without having to sit on a bus or change hotels every night. River ships vary in size, depending on the canals and locks they're designed to traverse, but even the largest carry no more than about 190 passengers (or roughly 5 percent of the passenger load on a typical oceangoing megaship). On many itineraries, the ships are able to tie up in the middle of the towns and cities that they visit, making it easy to reach local sightseeing attractions and shops on foot. The Rhine, which runs from the Swiss Alps to North Sea. A typical Rhine cruise takes about a week and goes from Amsterdam to Basel, Switzerland (or vice versa), with stops at cities such as Cologne, Düsseldorf, Koblenz, Heidelberg, and the French city of Strasbourg. The Moselle (a tributary of the Rhine) is also popular, often in combination with a Rhine cruise. Towns of interest include Trier, Rüdesheim, and Cochem in the Moselle winegrowing region. The Main runs across Germany and is connected to the Danube (see below) via the Main-Danube Canal. Ports of call typically include attractive small to medium-sized German cities such as Würzburg, Bamberg, and Nuremberg. Finally, the Elbe (in Eastern Germany) is a scenic but little-known river for English-speaking travelers. A typical cruise between Berlin and Prague might include stops at Magdeburg, Lutherstadt Wittenberg, Meissen, and the beautifully-restored Baroque city of Dresden in Saxony. Think about what you want to see and do: Big cities that you'll have a chance to sample (like goodies on a chef's tasting menu), or smaller cities and towns where you won't feel rushed? Local sightseeing on foot or by tour bus? Would you prefer an itinerary that's mostly within Germany, or do you want to visit as many countries as possible during your time on the river? Do you want a cruise only, or a "cruise tour" (see example above) with cities and attractions that aren't readily accessible by cruise ship? The latter can extend your touring possibilities, but it will mean spending a day or two (or more) traveling by coach. Would you prefer a cruise that's tailored to English-speaking passengers, or a cruise that mostly attracts German- or French-speaking travelers but also caters to English-speaking guests? If you're touring Germany on your own and would like to take a day cruise from a city that you're visiting, check with the tourist office to learn about local excursion operators. For example, KD (a.k.a. Köln Düsseldorfer Deutsche Rheinschiffahrt) operates roundtrip sightseeing trips from Cologne, Düsseldorf, and Frankfurt, plus point-to-point services on the Rhine and Moselle. Other examples of local excursion services include Klinger in Regensburg and Dresden's Sächsische Dampschifffart, which claims to have the oldest and largest fleet of paddlewheel steamers in the world.